Your scenic 3.5 hour tour begins with a 28 mile (approx. 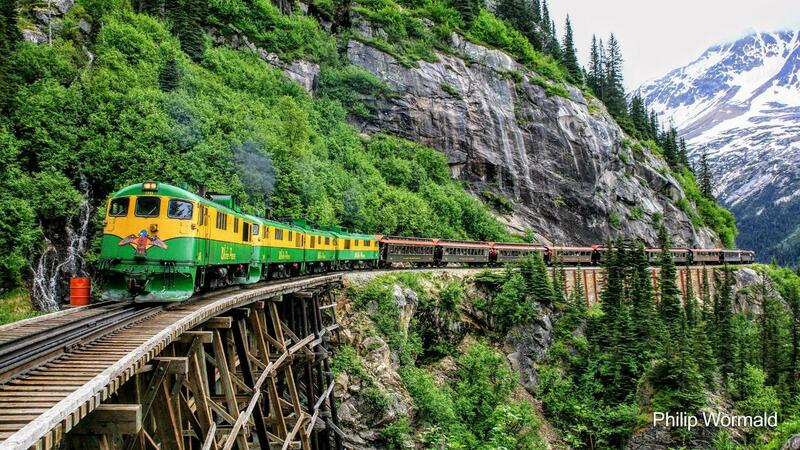 1 hour 45 min) journey between Skagway, Alaska, and Fraser, British Columbia, aboard the narrow gauge Scenic Railway of the World built in 1898. This railway is an International Historic Civil Engineering Landmark (along with the Eiffel Tower and Statue of Liberty). Experience the breathtaking panorama of mountains, glaciers, gorges, waterfalls, tunnels, trestles, and historic sites as you climb almost 3,000 feet in 20 miles. See the original White Pass Trail of ’98 worn into the rocks, a physical testimony to the thousands of souls who passed this way in search of fortune. Fully narrated with stories of Railroad and Klondike Gold Rush history. Vintage passenger cars are heated and have large windows and restrooms. Seating is first come, first served and will be in a passenger car with potential others not from our tour group. PASSPORTS REQUIRED. 3.5 hour tour, 53 miles roundtrip. TOUR MEETS AT OUR OFFICE at 3rd and Broadway in the Golden North hotel in Skagway at 12:30pm (15 minutes prior to departure time at 12:45pm). We transfer you by vehicle from office to train depot for boarding. Not available on Tuesdays or Sundays. This tour is NOT available for the following ships: Celebrity Millennium on Wednesdays, Royal Caribbean Radiance of the Seas on Wednesdays, Star Princess on Thursdays or Norwegian Jewel on Fridays when it departs at 5pm. 777DISCOUNT Promo code not valid for this tour.